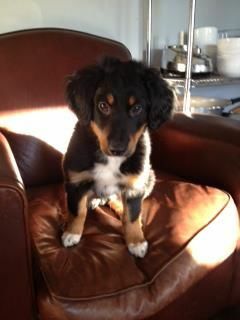 Boots the new puppy has now added chairs to his diet. The one I’m sitting on has scores of little teeth marks down the leg. Jo says it improves them because they now look old and worn. She says everything looks better with a little wear and tear, including me. Perhaps she’s just being nice because it was my birthday on Saturday. 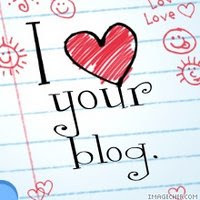 Jo says I’m turning into an antique – though I suspect she means one with depreciating value, rather than a valuable heirloom. Happy birthday to me. It’s been a decade since I properly marked the passing of my years. I really don’t see the point of drinking a toast simply to my survival: the end will arrive soon enough, so I don’t want to accelerate the process by spotting all the milestones on the way. I did celebrate on Saturday night, but that was due to the overwhelming euphoria generated by Newcastle United beating Chelsea at St James Park. When we scored the winning goal in the final minutes, I found myself at the centre of the biggest party in the world – fifty thousand revelers in united jubilation beats any cake with candles. Afterwards my football-mad friend and I really pushed the boat out and went for a curry with our wives. The aroma of victory, mingled with exotic spices, was a delicious farewell to my 60th year – and far more satisfying than some of the wilder parties of the past. It’s extraordinary how time seems to be speeding life up. Izzy’s age grew by a whole third a few weeks ago. The night before her birthday she said to me: “Daddy, I want to tell you a secret”, then whispered in my ear, “I want to be 3 forever.” “Why’s that?” I asked. “Because I don’t want to be old like Granny.” Intimations of mortality at 3: she’s been watching too much Toy Story. She has the movie on repeat, and plays Woody and Jessie games with all her friends. 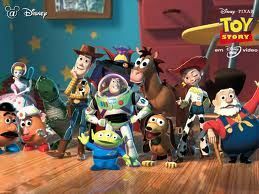 What I love most about Toy Story are the toys, which unite Izzy’s childhood with my own. Mr Potato Head was born in the same year as me. When I was little you had to stick the limbs and face into a real potato; now Izzy says I’ve started to resemble the plastic version. 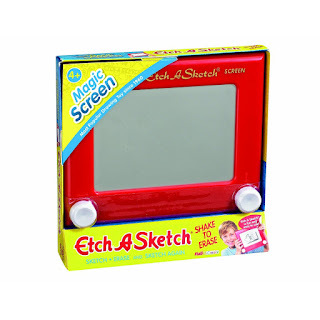 I was rather too old for Buzz Lightyear, but Etch a Sketch was born when I was six. I find it hard to believe I’m actually older than that wretched magic screen with its two little dials: “Fastest knobs in the West,” as Woody describes them. A French electrical technician called invented it and it was launched on the world’s children in 1959. Personally, I never really mastered the toy, probably because I possess neither dexterity nor patience, and certainly no discernible artistic ability. My mother, at nearly 92, still paints portraits and teaches art, and my eldest daughter is a professional sculptor and art curator, but the gene appears to have skipped a generation. Mind you, I imagine even Leonardo da Vinci would have problems with Etch A Sketch. Imagine if he’d doodled something vaguely creative, the only thing he could then do would be shake and delete it. Life’s too short for Etch A Sketch. 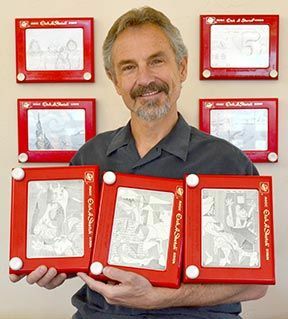 There’s an American called Jeff Gagliardi, who’s made a reputation out of Etch A Sketch drawings of masterpieces like the Mona Lisa. Each one took so long to create, he didn’t have the heart to delete it, so he’s ended up with galleries of them in his home in Lyons, Colorado. I hope there isn’t an earthquake. Eventually, however hard we try to etch a permanent legacy, all human life eventually fades to a blank screen, and that includes the man who created Etch A Sketch, André Cassagnes. Yesterday they announced his death in Paris at the age of 86. I‘ve just tried to write the letters RIP in tribute on Izzy’s own Etch A Sketch, but it came out as PUP. Which is appropriate, because Boots has just etched another antique notch onto my chair leg.